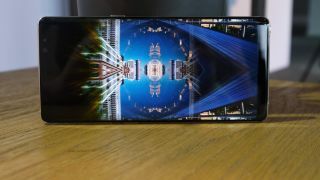 As if the upcoming Samsung Galaxy Note 8 wasn't already catching our eye as is, the flagship phablet is gaining another perk thanks to its massive, HDR-capable display and Netflix. Netflix is adding support for high dynamic range video streaming for the Samsung Galaxy Note 8, allowing users to beam higher-contrast, richer color content right to their phone, according to the service's support page. The Galaxy Note 8 joins a small but rapidly growing selection of supported devices that includes two other newcomers, the LG V30 and Sony Xperia XZ1, alongside the Sony Xperia XZ Premium, which joined Netflix's list just last month. Additionally, the LG G6 also features HDR Netflix streaming and is currently the only Android device listed that uses Dolby Vision — a separate high dynamic range format also supported by the video streaming giant. Despite the Samsung Galaxy S8, S8 Plus, Galaxy Tab S3 and infamously recalled Samsung Galaxy Note 7 all featuring HDR-capable displays, Netflix does not support high dynamic range streaming for those devices. A Netflix representative told TechRadar that it doesn't have any news to share regarding HDR streaming support on other Samsung devices at this time. The Samsung Galaxy Note 8 releases September 15 in both the UK and US, followed by September 22 in Australia. The handset will fetch a price tag as impressive as its high-end display, starting at $930, £869, AU$1,499.